One of the most time consuming and frustrating activities involves packing of goods or items when one is planning to move. A lot of effort and energy is wasted especially due to improper packing those results to a number of unpacking actions. It even becomes hard to track where some items are placed and this makes the entire process completely exhaustive. This is something that one should not experience at all. Interestingly, there s no need to worry any more when it comes to packing; things have now been made easier by the Snap ‘n Pack app. Everything now just happens with a snap! Whether someone is a last-minute mover or time-conscious, this app perfectly gives the best! 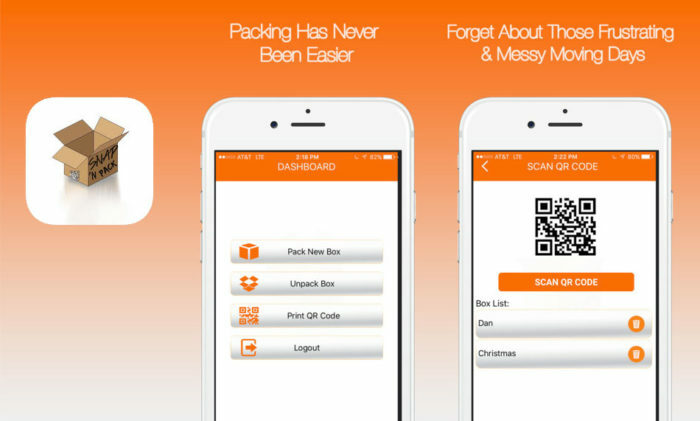 Actually, this no.1 app for packing is a product developed by Marybeth Everhart to assist even those packers who experience the messiest experience. It is new in the market having been released recently on 16th June, 2016. So far it has been rated highly (with a 4+ rating) proving how worthy it is when it comes to solving packing needs. Generally, the reviews are positive mostly being due to its informative nature of making packing much easier. It’s pretty simple to use this app when performing different types of packing. Apparently, this great app has been designed in a manner that it facilitates faster and easy packing without imposing much effort on an individual. There are numerous events in which amazing app can be of great assistance; this includes when one is relocating to a new residence, planning to store items and goods for future use, arranging different clothing and other seasonal decorations and even when moving to another country. Snap ‘n Pack app has absolutely made the moving exercise worth carrying out and making it a memorable one over time! This fantastic app gives the user great tips on how one can easily design and create easy-to-read labels. Such labels once developed can make the process of packing quite easy as they can be stuck on different packs in the correct manner. The process of taking a snap of the items ready for packing can highly assist the user to understand and recall all the items which have packed. This makes it quite easy to easily locate where different items were placed thus facilitating quick retrieval. No hassles at all! This feature is essential especially when one has designed different labels using the app. An individual can integrate the phone to the printer and make copies of the labels designed. This is meant to ensure that the labels match the expected quality displayed by the app. This feature is applicable where one is packing different items on boxes. Once the stickers have been printed, they can be perfectly attached on such boxes. Snap ‘n Pack app ensures that an individual will not be rummaging through the boxes looking for a particular item. Last-minute packer? Best tool for that! In the case where one waits till the last minute in order to start packing, the entire experience is always inconvenient and even turns out to be totally chaotic. There is an absolute solution now for the last-minute packers! Try out the Snap ‘n Pack app and truly no mess will be experienced at all! The Snap ‘n Pack app has been designed to facilitate a totally hassle-free packing and unpacking process. When it comes to unpacking, all that one is required to do is to just check through the QR code that had been stuck on different boxes with items. It all happens within a flicker of a second! Snap ‘n Pack has made packing an experience worth sharing. Clearly, everything has been made much easier and in a systematic way for packing-related activity. This in turn has helped users of this app to save energy and time. There is totally no hassle experience at all even in the scenario of late packing. Snap ‘n Pack app has proven to be an efficient tool and thus worth recommending to anyone undergoing packing hassles. It is available on App Store for free. Download it today and say bye to packing inconveniences! Snap 'n Pack has made packing an experience worth sharing. Clearly, everything has been made much easier and in a systematic way for packing-related activity.